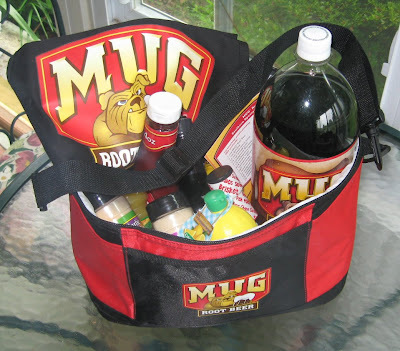 Today is the last day to enter the Mug Root Beer Father's Day Contest. Just click to the giveaway page and leave a comment. That's it. Very simple. Tomorrow, the boys will shake up the names, and their Dad will pull the five (5) lucky winners who will all get the cooler you see above along with a Mug apron and the ingredients to make a root beer barbecue sauce. I'll post the winners once I email the ones the boys' Dad pulls and let them know. Don't you just hate to be the last to know when you win something (-: So, the emails first . . . then the winners go up. If you've been reading along here at Barbecue Master (the title at the top clicks you to the newest content), then you'll see where I made up a batch of the barbecue sauce and had a grilled ham and country ribs. Know someone who rocks the grill or just enjoys grilling? Or, does this describe you? Feel free to enter. You can nominate your father or any other special man or woman in your life. The contest wraps up at midnight tonight (June 20, 2009). That's EST, since I'm in NC. Again - here's the page to enter and GOOD LUCK!